Bad Schmiedeberg, Germany. Language: German. Publisher: F.E. Baumann. Editor: F.E. Baumann, then Karl Heise. 6/1, January 1927-1928. 12 pp., 3 Marks a year. This was the organ of the Gral-Orden (Grail Order) in its last days as it attempted to make up for the lack of "Masters" by printing the inner teachings of the order that had been written by Parsival Braun and T.K. (John E. Richardson) and formerly reserved for students as they advanced through the degrees. See the note under Mitteilungen des Neuen Gral-Ordens. At the beginning of 1927 the journal announced that Heise had become head of the order and that a loose regional structure of "grail friends" was to replace the formal, ritualistic organization of the order. 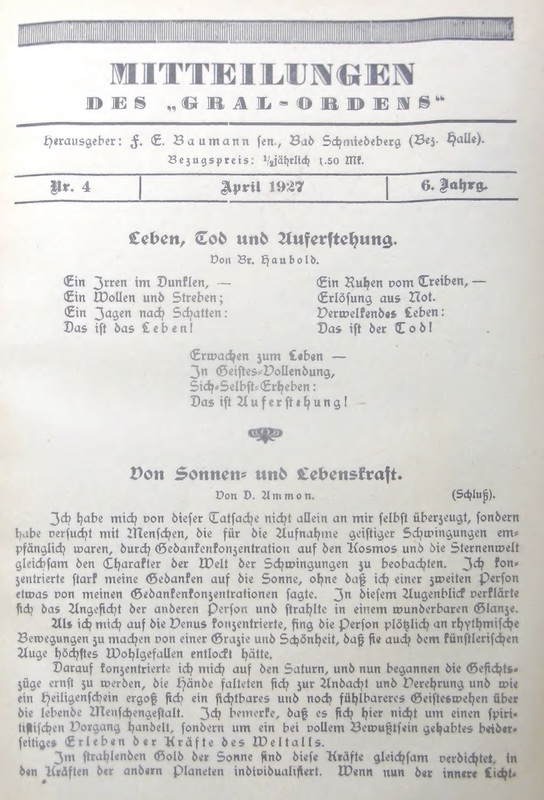 The last issues are filled with a discussion of the journal’s financial plight and suggestions on turning the order into an actual school, like those begun by Rudolf Steiner and Otomar zar Adusht Hanish. These desperate attempts came to naught. ZDB: Berlin SBB Haus Potsdamer Str; Halle/S UuLB; Leipzig DNB.